This book is written for students at technical universities and engineers working in rolling mills. It can be used for their individual examination preparations and for upgrading basic knowledge in rolling theory. Latter is necessary for solving daily challenges in practical work. Some equations are compiled to provide practical estimations of rolling parameters to be used in daily work. Crude steel production in the world has been raised to roughly 1.7 bn tons in 2014. In hot and cold flat rolling mills a part of roughly 70 % is further processed to semi- and finished products used e.g. in automotive, house packaging, ship building and construction industry in the developed countries in the world. Average production of further processed flat products in the world is roughly 50 % of the complete crude steel production. Flat rolling is a forming method aiming in reduction the cross-section area of a work piece (e.g. semi-finished ingots), enlarging its length and adjusting its properties like geometry, ductility, strength and surface finish structure. In the flat rolling process the rolls are cylinder-like and the cross-section of the rolled material is rectangular. The material is squeezed from height in prior length direction, but partly as well in width direction. The width flow direction is undesired in many applications. Under the assumption that width size is larger than tenfold height size the rolling pocess can be considered to be without material spreading (plain deformation). In this case the stripe model of the elementary plasticity theory can be applied for calculation of the integral parameters like roll force, roll torque and roll power. Regarding material insert temperature it will be distinguished between hot and cold rolling. Hot rolling is performed above the recrystallization temperature of the material. Cold rolling usually takes place at ambient temperature. But the material temperature can increase due to dissipation effects during cold rolling. In the case of flat rolling the material is hot rolled in the first rolling steps. This is because of the reduced roll forces needed and the increased material formability at high temperature levels. Disadvantages of hot rolling are the high energy use and scale formation. Due to heat loss of the material hot rolling is not practicable for thin strip. In this case cold rolling is performed. Cold rolling in the process chain of an integrated steel works improves the material surface finish and material properties. 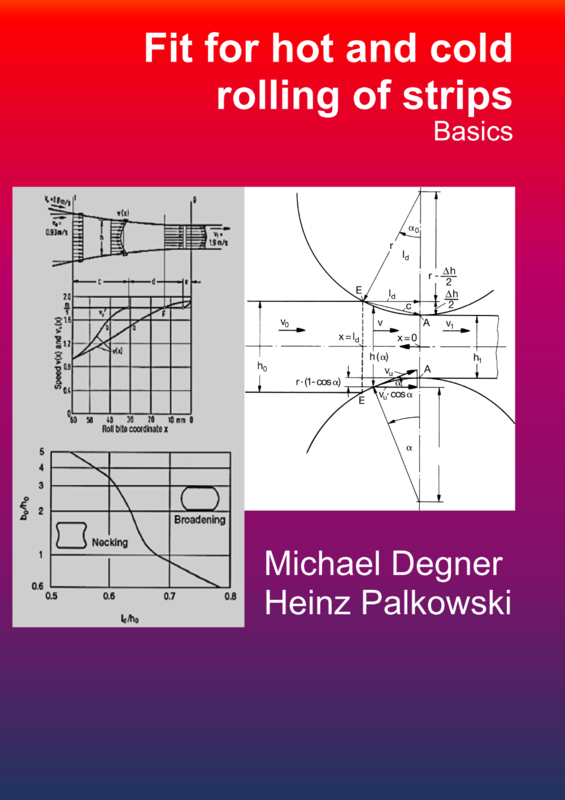 This book gives the basic equations and nomenclature of hot and cold rolling technology including the derivation from physical laws like mass and energy constancy and the third Newton axiom. These equations are used for the exercises given in “Fit for hot and cold rolling of strips”.